Several fund raisers are coming up that will benefit the local Family Resource center. They are in need of funds to keep the center going. So several events have been organized to help raise some money. This Sunday (10/16/11) is the first Event. Sunday Beach Day!!!! October Sunday Beach Jam at Magen's Bay Beach!!! Music starts at 11am, come on down and enjoy great music from many local musicians, food, beverages and plenty of fun in the sun, all proceeds benefit the Family Resource Center. 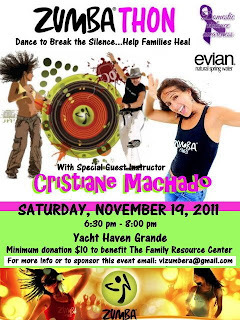 Another event is a Zumbathon that will be held at Yacht Haven Grande on November 19th from 6:30 pm to 8:00 pm. A friend of mine who is organizing it set up a PayPal account to pay the entrance fee for the event or just to donate money to the cause. October is Domestic Violence Awareness month, to help my local community I (along with a wonderful team of loving people) am organizing a Zumbathon (fundraiser) for the local organization - "Family Resource Center" - that works to prevent domestic violence & sexual assault. We have a wonderful Zumba Jammer - Cristiane Machado from Rio de Janeiro leading the Zumbathon along with some of your local ...instructors. If you would like to support/sponsor/donate this event please contact me. All proceeds will go to sustain the vital work that the FRC does for our community!!! Please support us & show your ♥!!! After the Zumbathon, on the same day (11/19/11), there will be a dinner/dance at Wikked with a Motown theme. 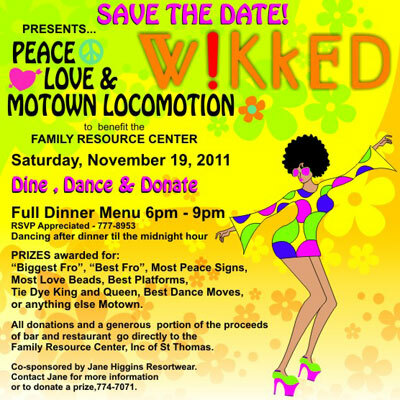 No tickets/no gate, just DINE, DANCE AND DONATE!!! what you can. Suggest if you want to be able to dine and have your own table , call in reservations to WIKKED , ask for Jeff or just make the reservation 777-8953, they can do up to a 10 top. WIKKED will serve tapas/appetizer menu after 9pm during the dance event.